Alain Chartier (1385 - c1430), was born in Bayeaux and studied at the University of Paris. He lived his life in a difficult part of his country's history, the Hundred Years War. He is best known for his poetry and his political writing. A particularly well-known work is La Belle Dame sans Mercy, whose fame was enhanced when John Keats borrowed the title in 1884 for one of his own works. 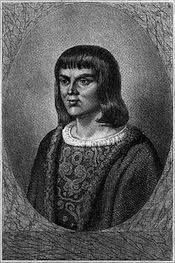 A number of Alain Chartier's works are in Latin, and his latinity is emblematic of the Middle Ages, where Latin was in most cases the official written language, and where, in Chartier's time, French was emerging as an interprovincial language. Nearly 180 extant manuscripts through the first quarter of the sixteenth century contain at least one of Chartier's works. We have listed online facsimiles for as many as we have found and have done the same for incunabla. This page is part of the Andy Holt Virtual Library's "Manuscripts of Medieval France with Vernacular Texts", a collection of nearly 1000 links to manuscript facsimiles and nearly all of the French medieval literarary canon. MS Paris BNF fr. 1896 [Ancien 7262 (3.3) - Alain Charretier, Le Quadrilogue invectif, L'Esperance, etc. MS Paris BNF fr. 4939 - 3 « Cy commance le Breviaire des nobles, fait par maistre ALAIN CHARTIER, etc. MS Paris BNF fr. 25434 - Le Breviaire des nobles, composé par maistre Alain Chartier, etc. MS Paris BNF fr. 25548 - ...frangment du Dit de la paix d'Alain Chartier, etc. MS Oxford E. D. Clarke 34 - Livre d'espérance; Le Curial; La Complainte; Libelle de paix, par Alain Chartier [2 at bottom] alt. Hult, David F. "Alain Chartier in Manuscript: Authorial or Scribal Culture?"